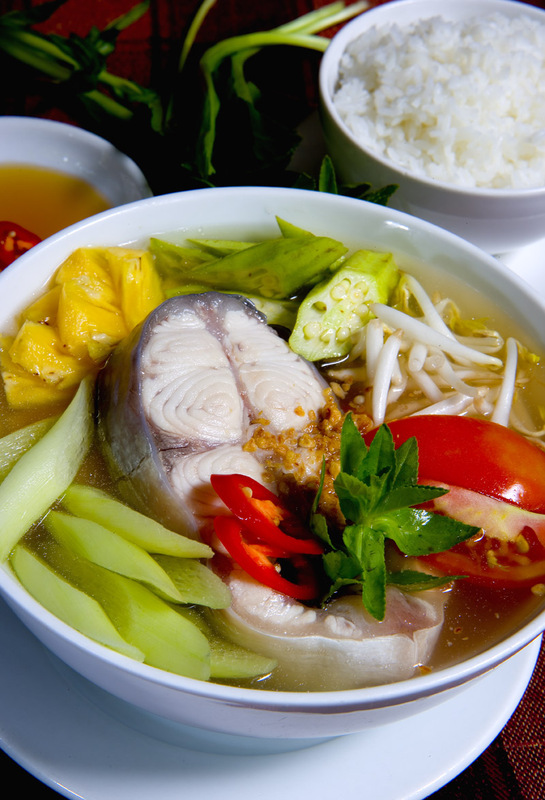 We absolutely adore canh chua ca - Vietnamese sour fish soup - so devoting some of our Saigon trip to learning more about it (and eating a good amount of it) was no hard duty. Read the result in today's Wall Street Journal Asia 'Weekend Journal'. 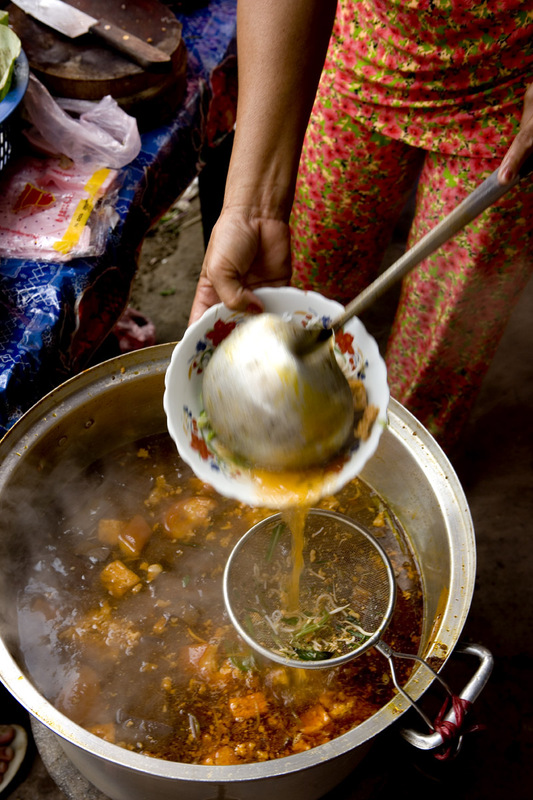 Sour soup is found in many Southeast Asian countries (sinigang in the Philippines, samlass m'chou moan in Cambodia, tomyam in Thailand, sayur asam in Indonesia), suggesting that it may have developed separately in each locale, probably in response to climate. Souring agents such as tamarind, lime juice, and vinegar are believed to possess antibacterial (and other healthful) properties, which would have come in hand in the days before refrigeration, and sour flavors are thought to have a cooling effect on the body. 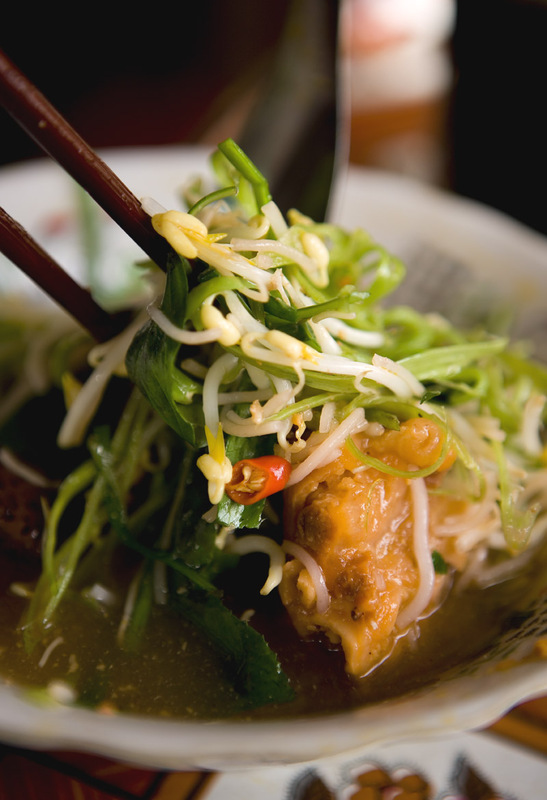 'It's got zip to it,' says Ms. Nguyen of canh chua ga, and indeed the light, clean, sharp edge that sourness lends dishes is refreshing and energizing in tropically torpid weather. Perhaps most importantly, 'sourness rouses the appetite,' she adds. 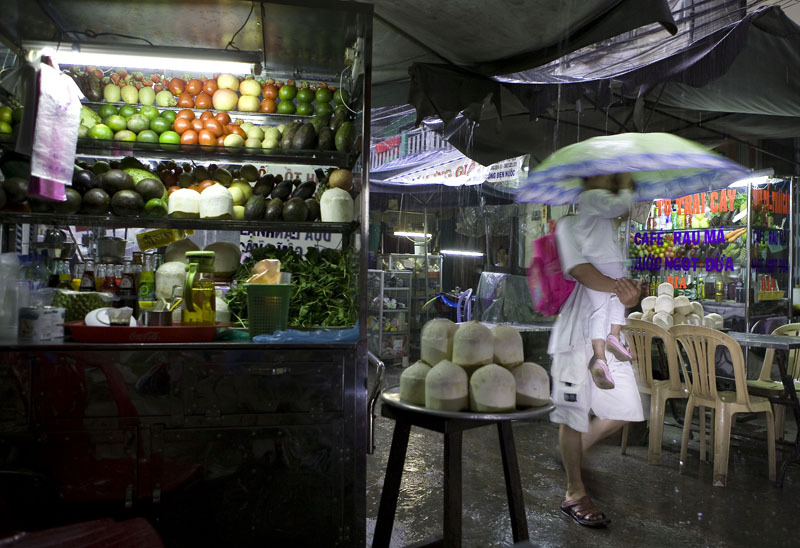 The Southeast Asian sour flavor profile accounts quite a lot, I think, for my love for the region's cuisines. 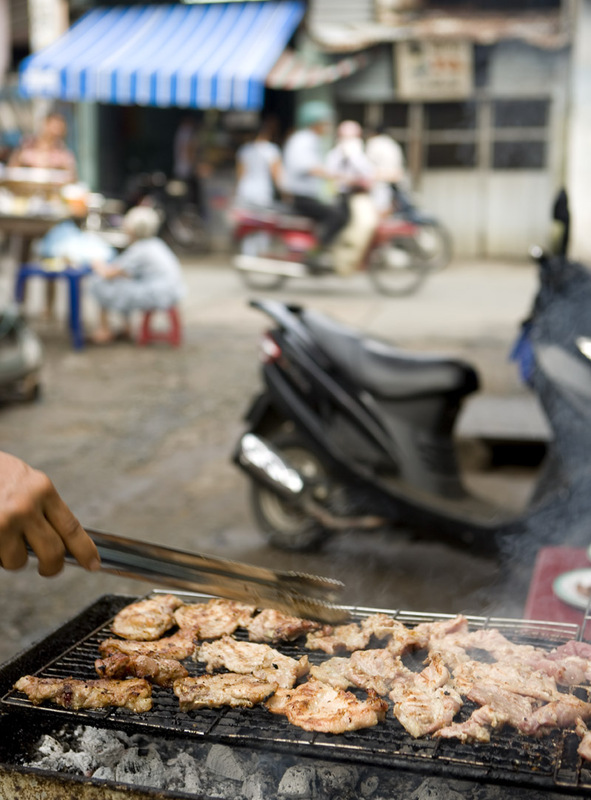 When I first lived in Asia almost twenty-five years ago one thing I really had trouble adjusting to was the propensity to eat hot (from heat and, sometimes, spice) foods in steamy weather. I've come around to the view that it's a good, reviving thing to sweat a bit over your meal. If it's a sour and hot dish, so much the better. There really is something about a sour soup that perks you up on a horridly wilting day. 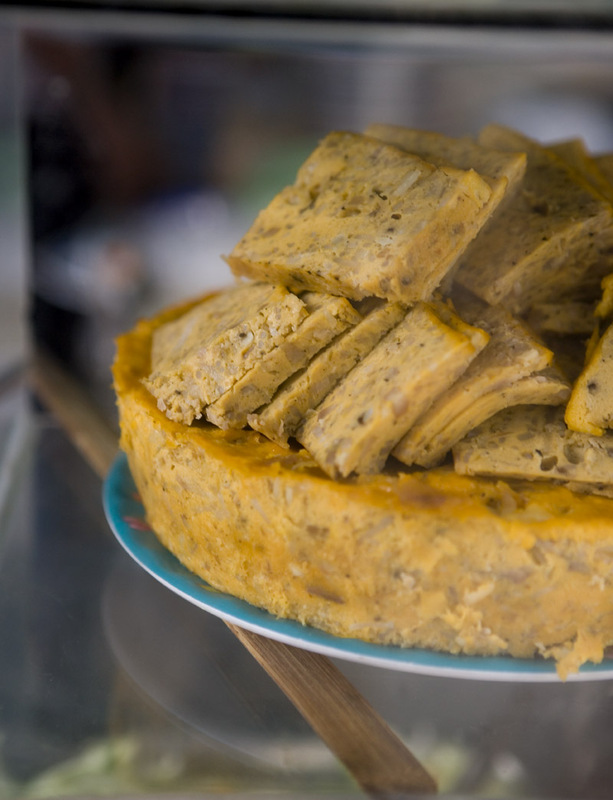 As part of the research for this article we visited with Nguyen Dzoan Cam Van, a lovely woman who is perhaps Vietnam's most well-known food personality. She showed us how to make a fantastic central-style sour soup that's chili hot and soured not with tamarind but with fermented bamboo shoots. Once Ramadan is over and my favorite Malay vendor returns to the market with her freshly fermented bamboo shoots I'll try to recreate it and post it here. 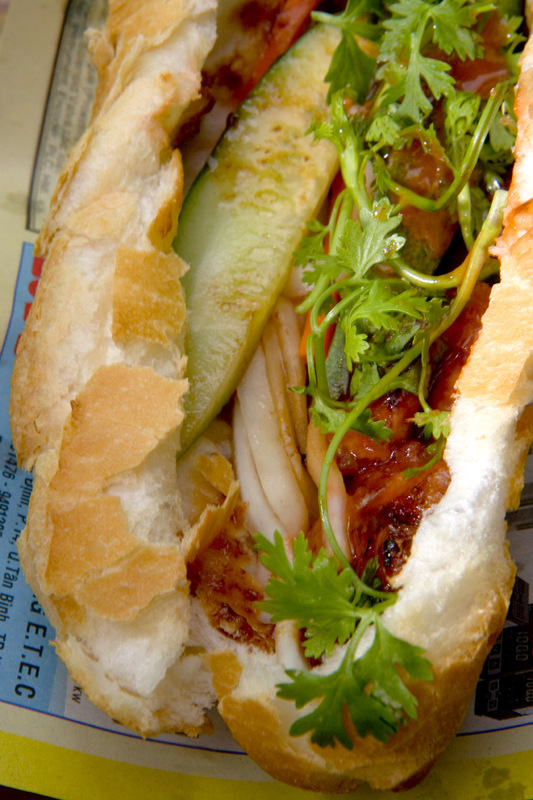 Is this the best street sandwich in all of Saigon? Frankly I'm not qualified in the least to answer, having passed a shameful 2.5- banh mi-free years in the city. But after reading noodlepie's comment on our last banh mi post and - especially - his hot and heavy ode to this District 1 purveyor's version, there was never a doubt but that we'd stop by this now-famous stall on our last trip in August. 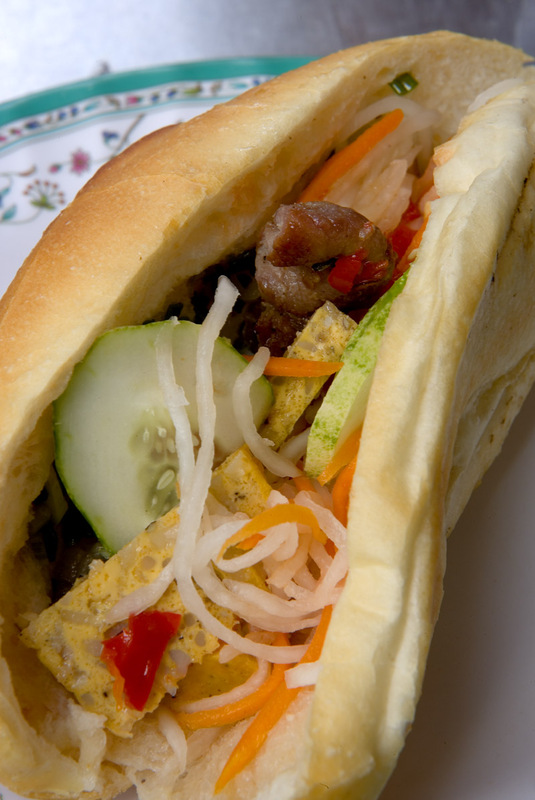 This banh mi vendors trades in thit nuong (barbecued pork - patties, in her case) sandwiches. To avoid what we understand can be quite a lengthy queue we arrive just before 5, when she opens for business. She greets us warmly - NOT! But that doesn't matter because we're here for the sam, not the smiles. There's only one customer ahead of us (though she's placed an order for 5 sandwiches). She and I and Dave hover over the the grill, waiting for the meat to turn from pink to crusty brown. Even though we've been snacking non-stop since morning the pork vapors rising from the grill fire up our appetites, and we hungrily watch as she assembles our bahn mi (just one for the two of us - we had more eating to do that night): a slather of the barbecue sauce that got noodlepie's juices flowing, a dash of hot sauce, meat, the classic carrot-daikon pickle, a couple cucumber slabs, scallion, and plenty of cilantro. Dave's liking it, but I'm less than impressed. Now, Pieman - a 'harlot of a hoagie'? Only if by that turn of phrase (and an artful turn of phrase it is) you mean 'dressed in something cheap and red'. Perhaps it's a function of the nasty bottled barbecue sauces that peppered my sixties-and-seventies middle American upbringing, but I'm not loving that scarlet goo. 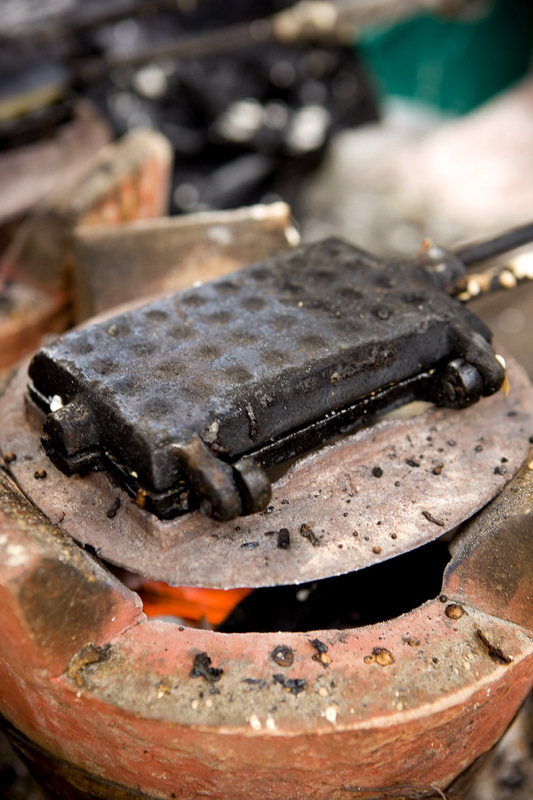 It's sweet, it's fakey-smoky, and, worst of all, it masks something truly beautiful: the flavor of grilled pig. 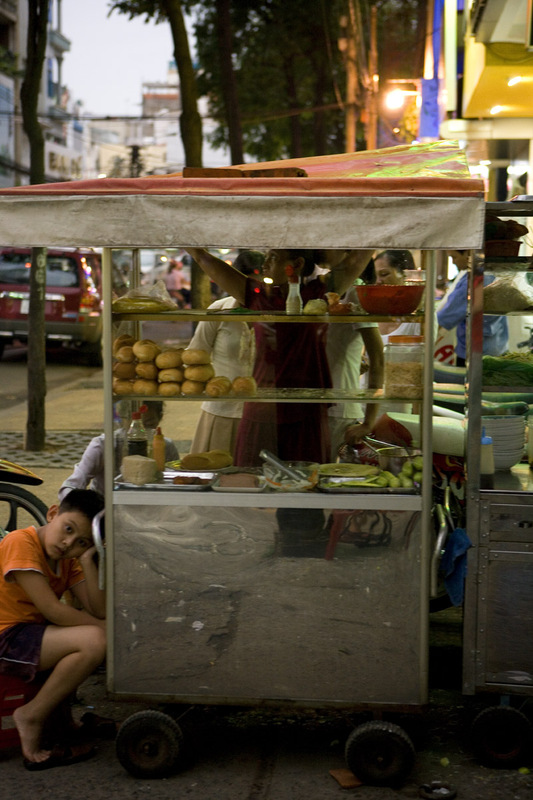 Banh mi thit nuong, stall at 37 Nguyen Trai street in District 1, Saigon, Vietnam. From 5pm. And apparently not on Sunday. John Lee and his wife Sally run Seng Huat, an old bak kut teh shop in Klang. They're two of the nicest people you'd ever want to meet. And their version of this Hokkien Malaysian specialty is pretty fantastic. 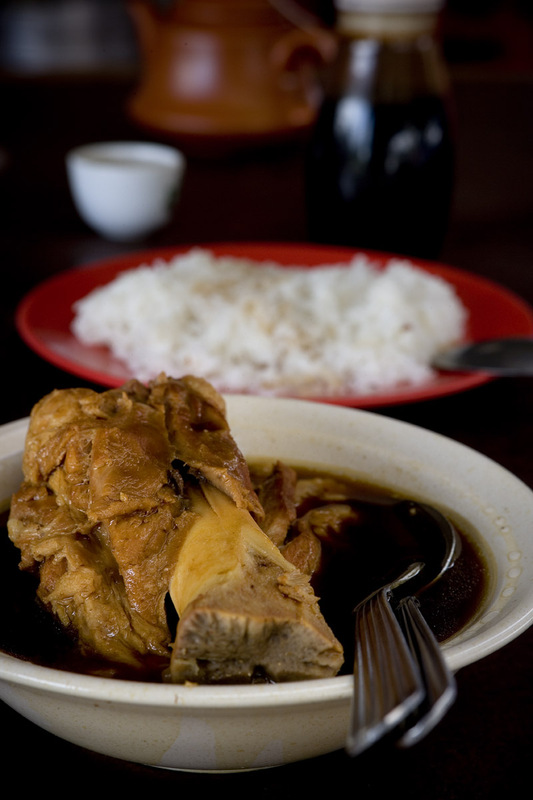 'Meat bone tea' (that many Chinese Malaysians mis-translate the dish's characters as 'pork bone tea' tells you a little, I think, about their passion for the other white meat) is comprised of pork (and parts) long-stewed with soy sauce, spices, and Chinese medicinal herbs. It tastes much better than it sounds. Malaysian pork is generally excellent, uber porcine in flavor and nicely fatted, and it marries beautifully with the spices and herbs that go into the dish (black and Sichuan peppercorns, cinammon, star anise, ginseng, goji berries, Chinese foxglove, and dried orange peel, to name a few). 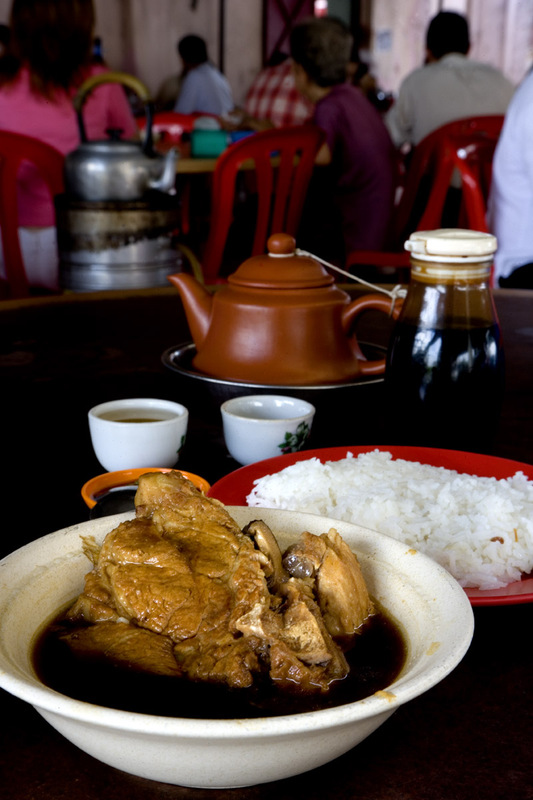 Bak kut teh is both tonic and comfort food, plain and simple but, in its spareness, quite elegant. 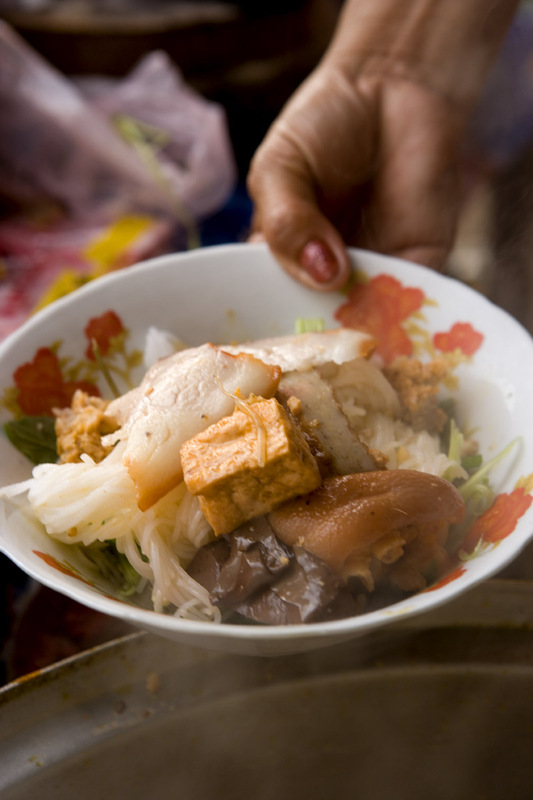 It's also a somewhat unique dish in that its origins - unlike those of other Chinese Malaysian specialties, such as wonton mee and yong tau foo - can't be traced back to the mainland. It's one hundred percent Malaysian, an invention of Hokkien Chinese (from the southeastern province of Fujian) in Klang, a port city about an hour from Kuala Lumpur. And so, a few weeks ago, we found ourselves at John and Sally's place - which is also known (because Malaysians, notoriously unable to remember street names, locate every famous eatery by landmarks) as 'Under the Bridge Bak Kut Teh'. Seng Huat does indeed sit in the shadow of a pedestrian bridge. 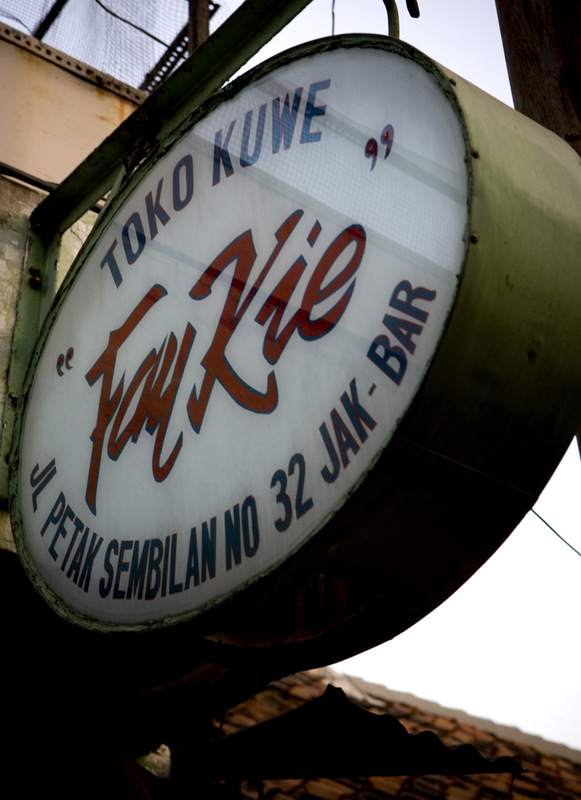 And it's in this part of Klang that, allegedly, bak kut teh was born. John told us that he inherited the business from his dad, who inherited it from his father, who started selling bak kut teh during World War II from a push cart under the bridge. 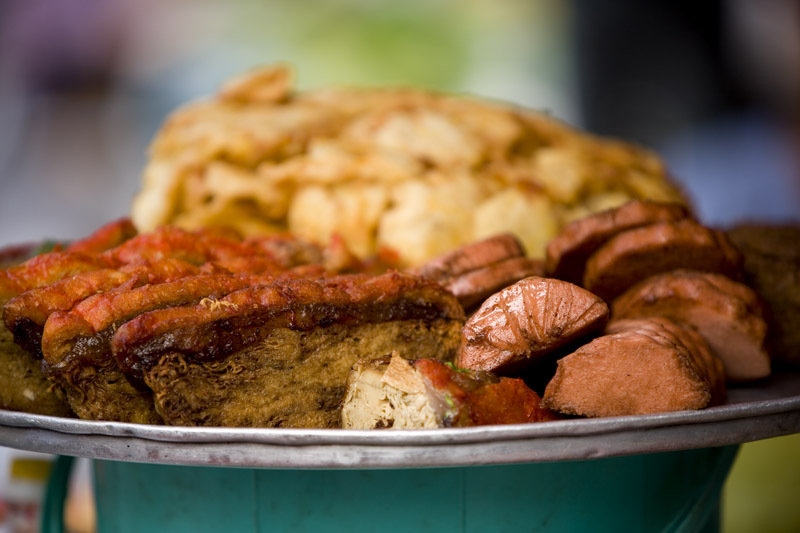 At that time the dish was called simply bak kut - 'pork bones' or, more colloquially, 'pork rib soup' - and it was breakfast for the coolies who loaded and unloaded boats along the river. After the bridge was bombed by the Japanese John's grandfather moved his bak kut stall a few streets over and, eventually, into a shop house. 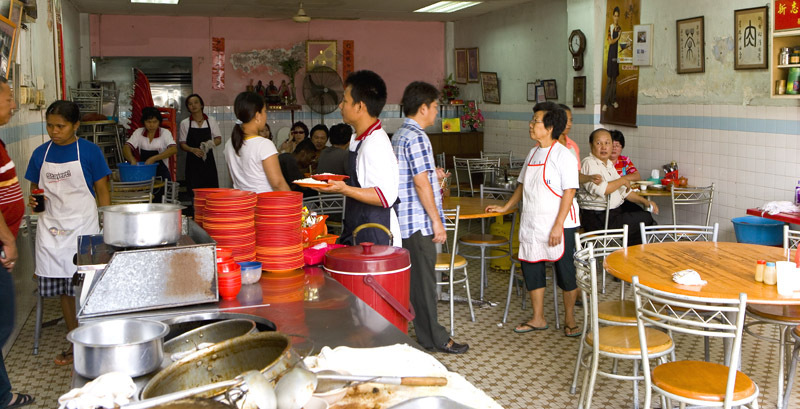 That bak kut teh shop, run by relatives of John's, remains in operation today. In the sixties John's father moved his grandfather's business back 'home' under the bridge, to the corner shop it occupies still. I'd assumed that the name 'meat bone tea' came about from the way the dish is made, with lots of herbs simmering away for an hour or more to make a dark, tea-colored broth. Not so, John says. 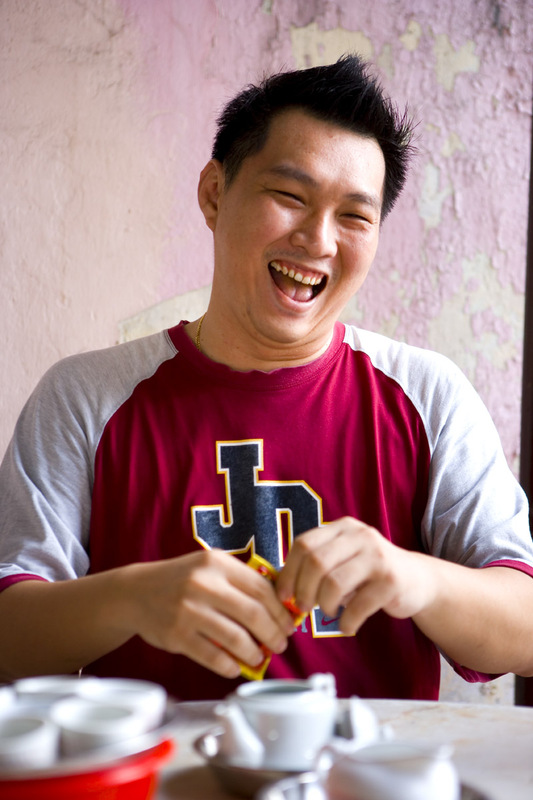 His grandfather's name was Lee Boon Teh, and the dish his regular customers called bak kut Teh (or Teh's bak kut, 'teh' being the Hokkien pronunciation of the Chinese character for 'land') eventually became known more generally as bak kut teh ('teh' being the Hokkien pronunciation of the Chinese character for 'tea'). John doesn't claim that his grandfather invented the dish: 'Sure there were other vendors selling meat rib soup and rice to port laborers at the same time he was,' he says. This isn't a guy who just sells bak kut teh. He lives it, loves it, eats it at least once a day and, from our experience, can discourse on it for a couple hours straight. Seng Huat's version is made according to John's grandfather's recipe, with a (secret - we sniffed the spice bags but didn't peek inside) mixture of ten herbs and spices, Chinese dried mushrooms, and 'black' garlic. Unless you request a claypot the dish arrives as it was traditionally served, each part of the pig - leg, say, or ribs or stomach - in a separate bowl of soup. Though it now features big chunks of meat and, if you wish, innards, this dish was once poor man's food and incorporated only bits of pork and ribs. 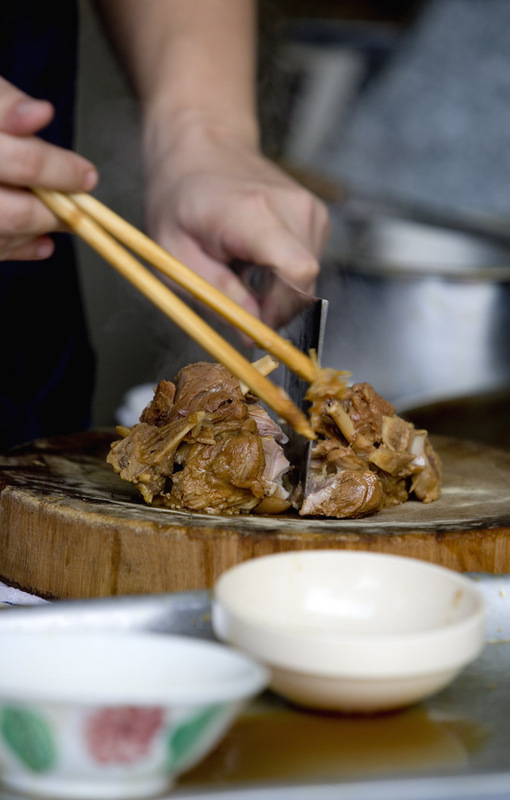 Back in the day it was eaten with chopsticks, but nowadays fork and spoon are the utensils of choice - all the better to tear apart those large chunks of meat. 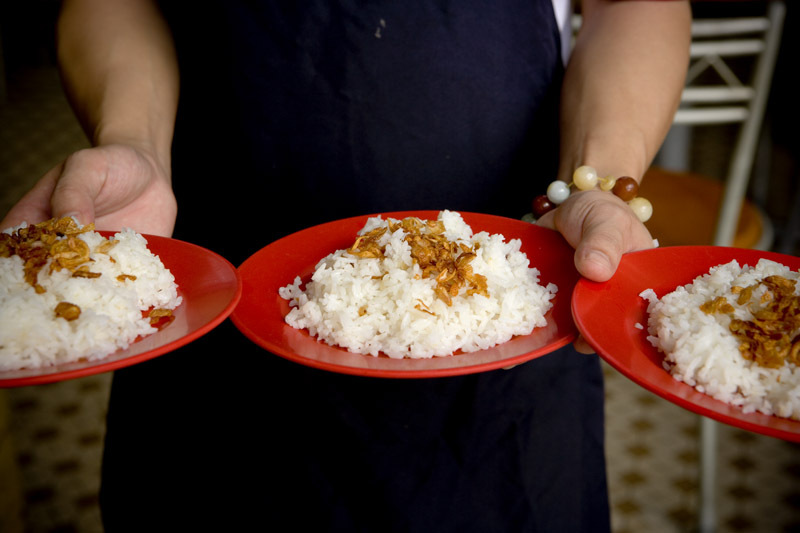 'Meat and soup are important,' says John, 'but rice is also key.' 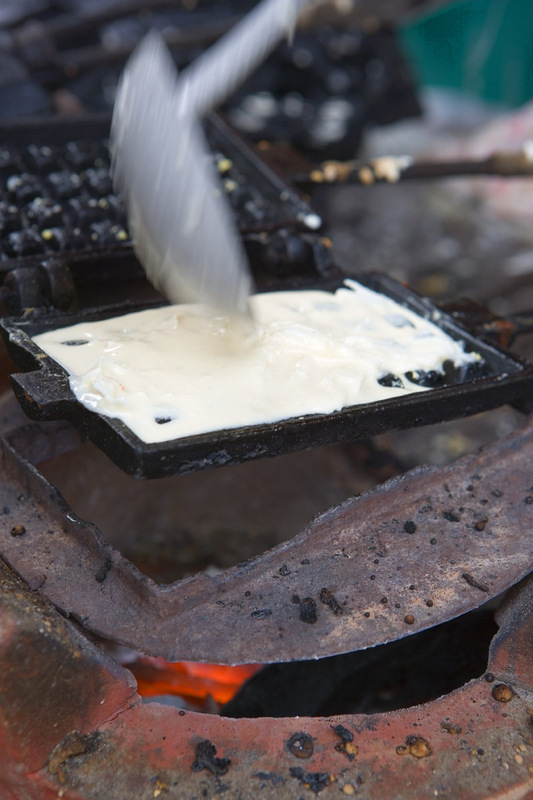 So Seng Huat's is cooked in tasty lard and topped with crunchy fried shallots. The shop's bak kut teh soup is a gorgeous tawny brown and neither too qing (clear and watery) nor too nong ('sticky' or viscous). It's got body and a load of fragrance, with a prominent but not overpowering herbal flavor. 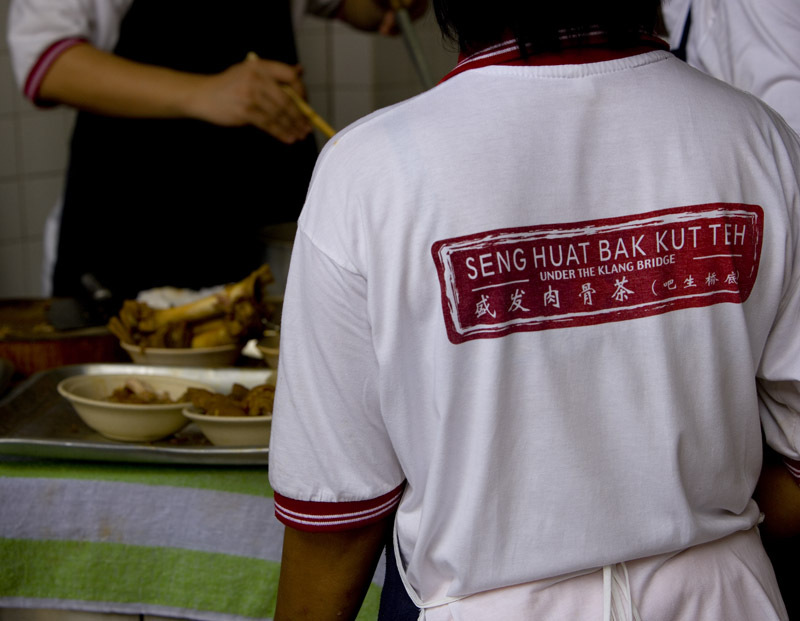 Bak kut teh appreciation is highly subjective, but for us Seng Huat's version places the proper emphasis on meat and broth; here you won't find the add-ins (deep-fried tofu, bean curd skin, canned mushrooms) used by many other shops. 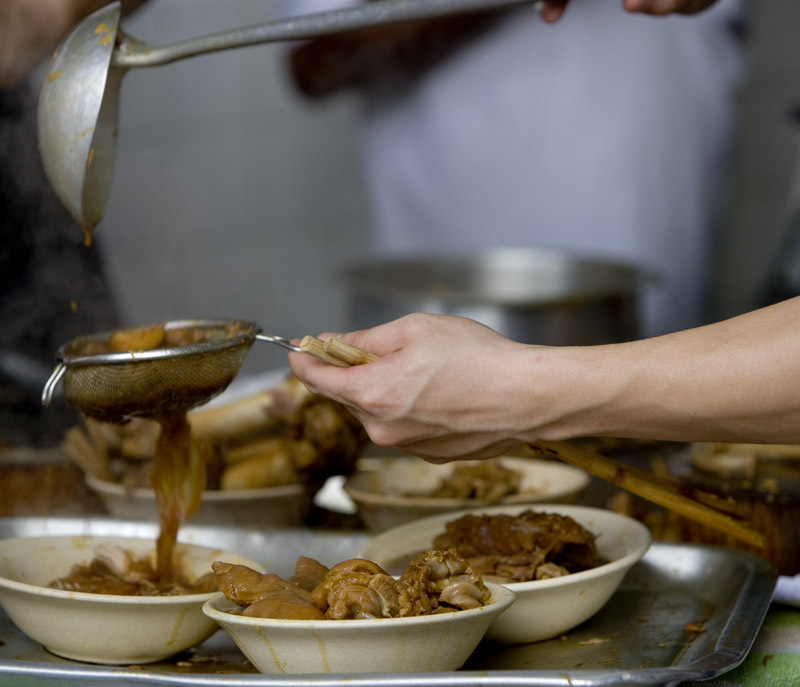 John's only thirty-three years old, so Klang residents and anyone else willing to make the drive can look forward to many more years of Seng Huat's bak kut teh. It's invigorating to spend time with a young couple enthused about upholding culinary traditions. 'We work all the time,' John and Sally told us (and they have three kids to boot), 'but we really love what we do.' Folks like them should be considered national treasures. Seng Huat, No. 9 Jalan Besar, Klang. Breakfast through about 2pm, dinner from 6pm. Be advised - they sell out every day so arrive early to avoid disappointment. Since Monday I've been on Langkawi, on assignment. I know what you're thinking -- but it really is work, tiring, all-day work, even if it is on a beautiful island. At any rate, I owe you a post, and I happen to have half an hour to myself and a stick drive with a backlog of photos. 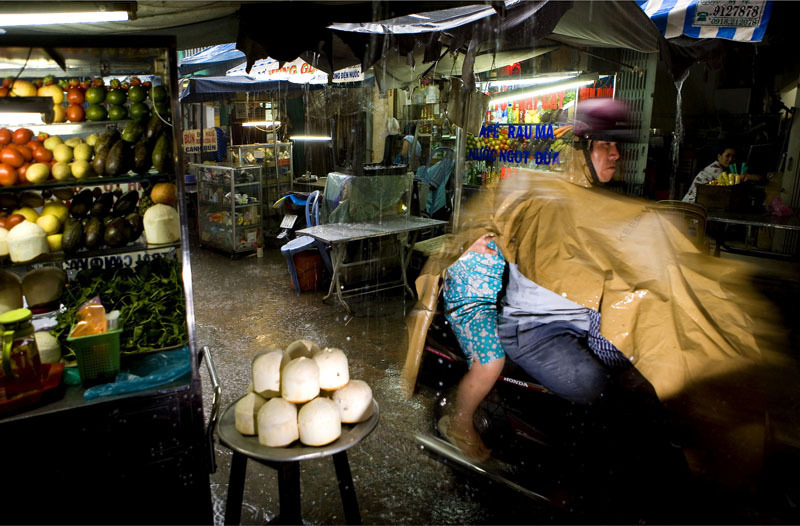 A month or so ago I had an interesting conversation with food writer Andrea Nguyen about street food. 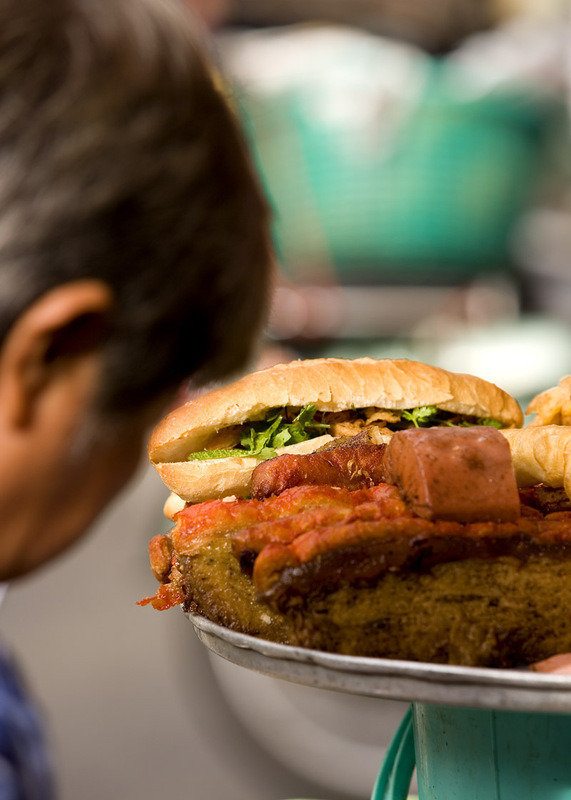 'When I see a crowd of people around a food vendor,' she said, 'I want to be part of that.' I know exactly what she means. 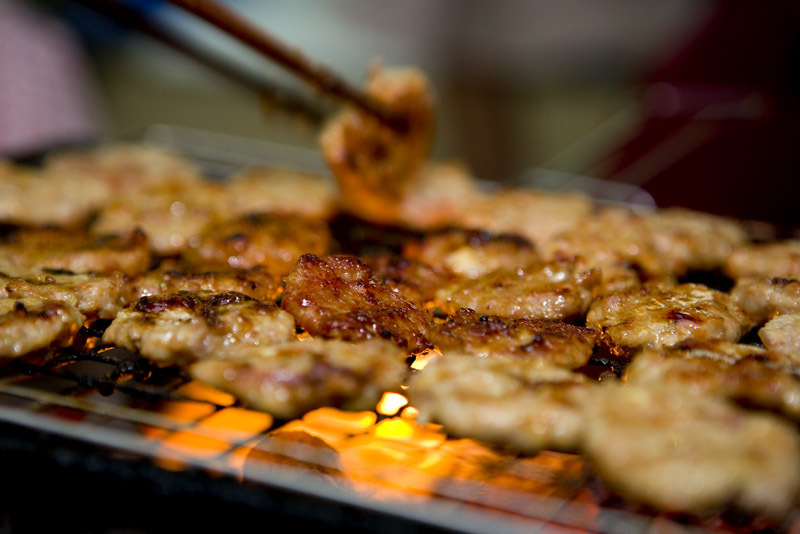 Many of our street food experiences are prompted by the sight of a swarm of customers at a stall or shop or cart. What's the excitement all about? we wonder. And we want to find out. There were two kind of rice on offer, white and coconut-scented, and turmeric hued. The latter was by far the more popular. We ordered one bungkus (package) with 'everything', then packed it away to eat later. and ended up wishing we'd ordered two. The rice was just perfect, neither dry nor mushy, every grain distinct. 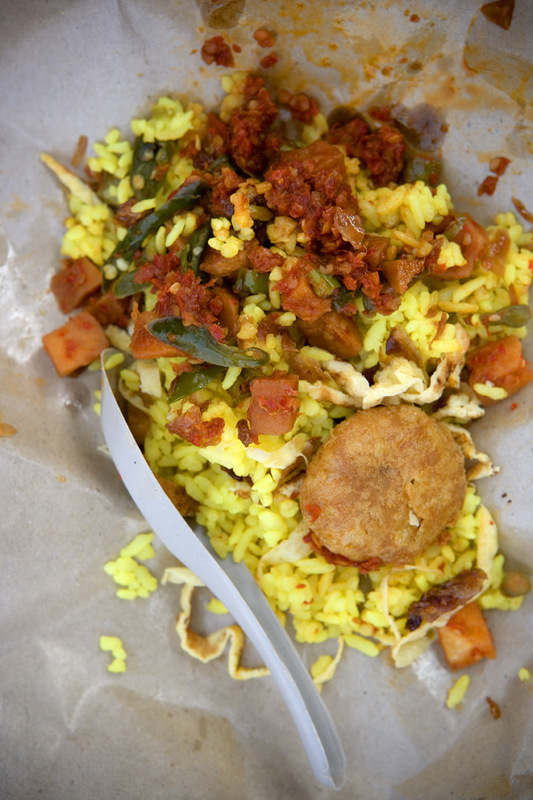 Tiny cubes of curried potato, omelet strips, a super spicy red chili sambal, slices of softened green chilies to mix in with the rice, and a substantial pergedel (potato patty dipped in egg and deep-fried) rounded out the meal. Pretty simple, but pretty spectacular too. Trust me: always follow the crowd. Ever feel like you've bit off more than you can chew? I do, today, with three deadlines met in the last 7 days and three more ahead in the next seven. In short, I'm overwhelmed. So, posts will be a little thin until I can catch my breath (I'm shooting for Friday). 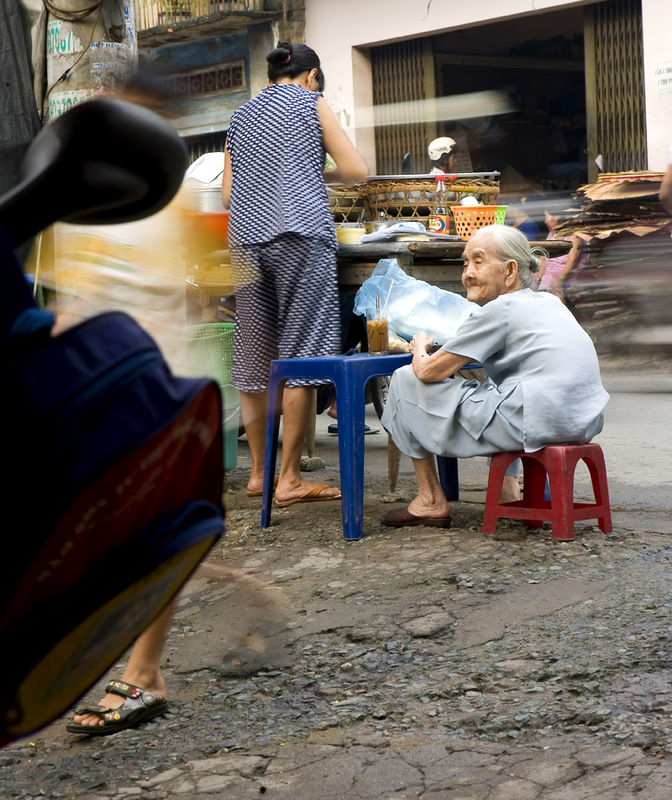 In the meantime enjoy this photo, taken by Dave recently at PJ (Petaling Jaya)'s Old Town Market. 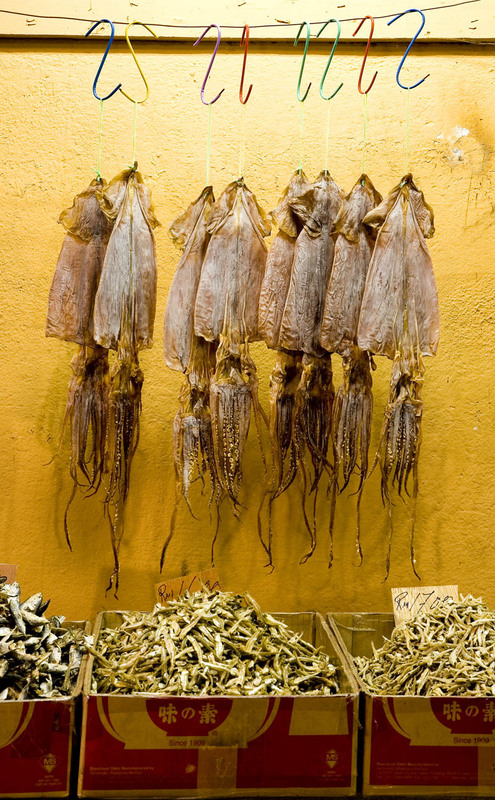 Dried seafood never looked so good. And yes - that's a new banner, another one. We've determined that remaking EatingAsia is too big a task for either of us (even if we did have the spare time). We're calling in help but it won't arrive for another month or so. In the meantime, I'll be doing what I can do to keep the blog looking fresh. 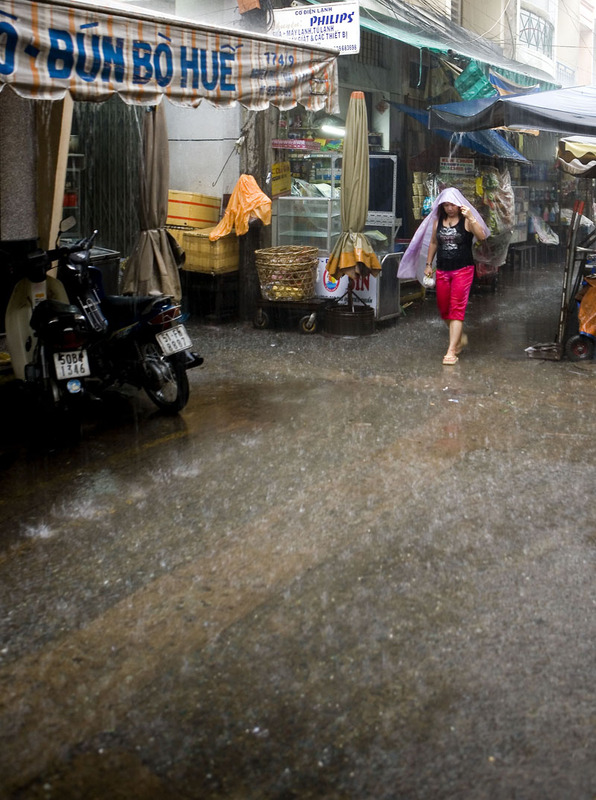 We'd forgotten how it rains in Saigon. And rains and rains and rains. 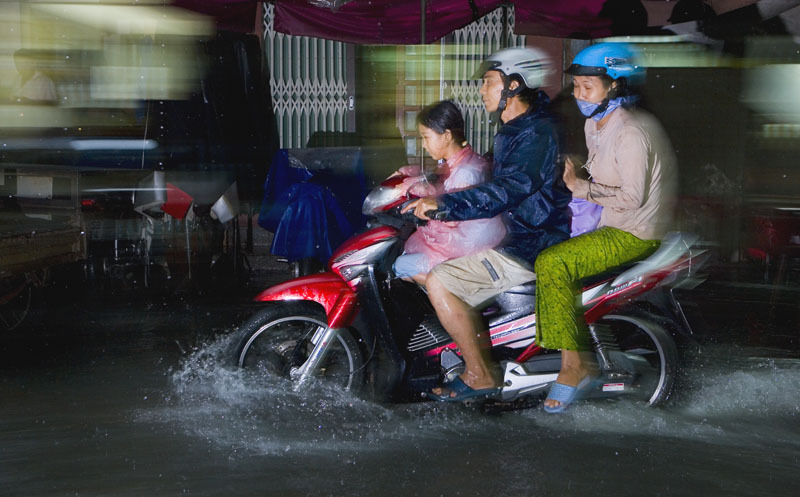 This time of year, there's no waiting out a downpour. 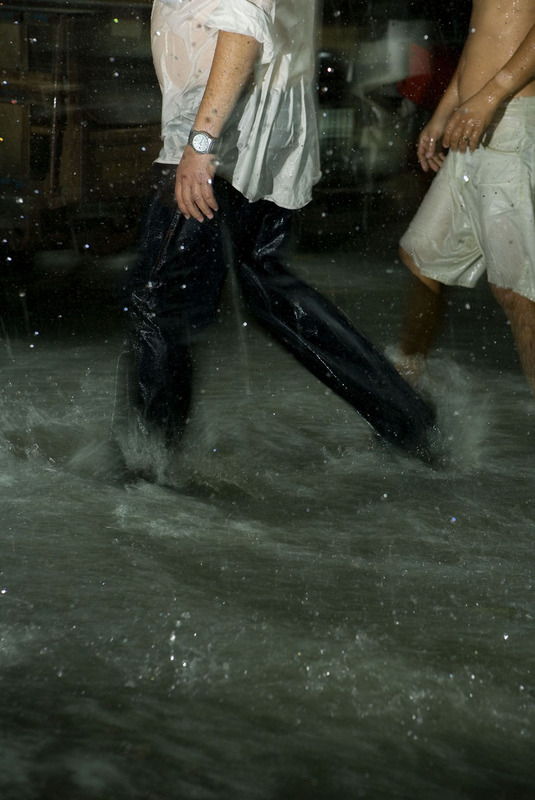 If it catches you unprepared, get prepared - to get very wet. 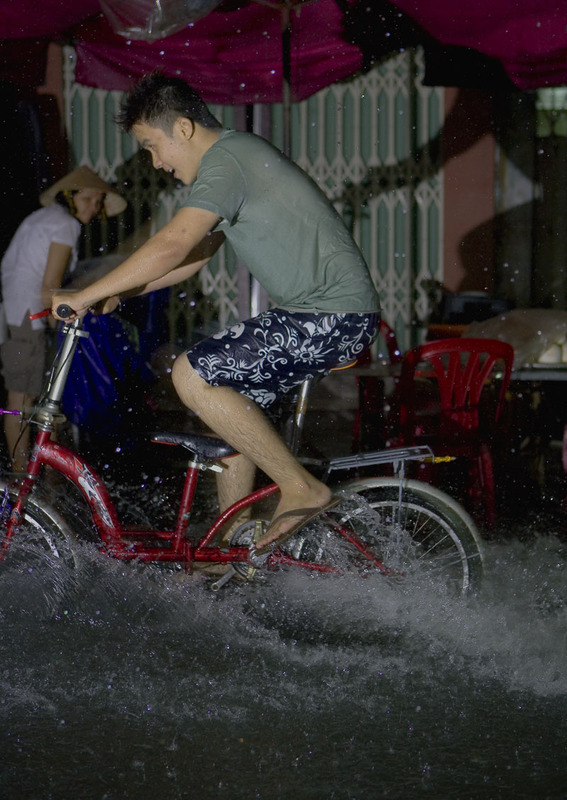 We got caught at the extreme edge of District 3, near the corner of Nguyen Dinh Chieu and Nguyen Thien Thuat streets. The neighborhood is an interesting grid of food stall-lined lanes, and we were wandering after a late lunch, scoping out dinner possibilities for later in the week. 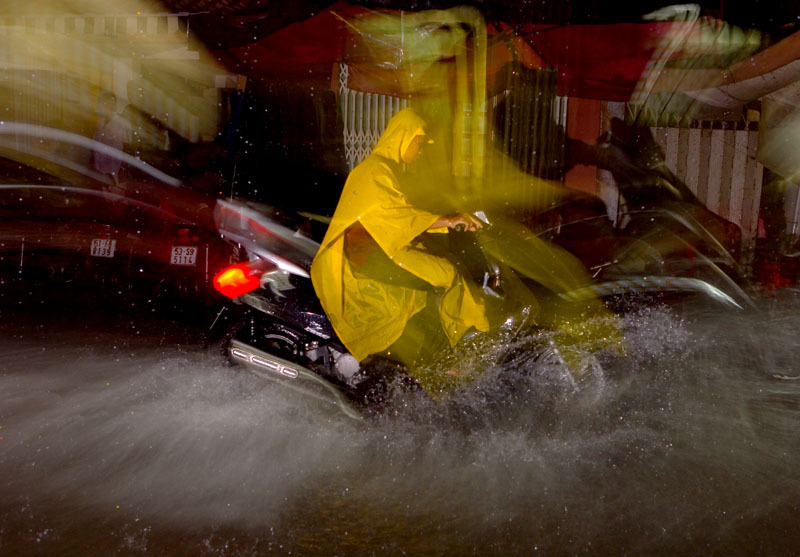 In retrospect, the steadily graying sky and distant rumbles of thunder interspersed with the occasional jagged slash of lightning should have been signal enough that it was time to catch a cab and head back to our hotel. Instead we ducked down an alley for a little refreshment. We'll wait it out, we thought. Our table sat under a wide umbrella, and it was actually kind of cool to sit there all cozy and juiced/caffeinated up and watch alley life go by. Then it got a little darker, and started to rain a little harder. Our umbrella started to leak. The ladies running the juice stand kindly waved us into their kitchen, where we perched on stools and watched them stomp on the roaches that ran in to escape the rising waters. They seemed to know something we didn't, because they fitted a plank at the base of their door frame. A half hour later, still raining. Hard. The juice ladies ushered us out of their kitchen and across the alley, where a neighbor generously offered her stoop. As she and her son and her mother hung about the dining table watching TV we hunkered in their doorway, watching the water rise. A lot of time to think on that stoop, watching the rain, and the juice ladies across the way push that plank down to the base of their door frame and hold it there with their weight as the water rose, before finally giving up and retreating with their kids to the second floor when it rushed over the top and into their house. Black, nasty water with bits of trash floating in it, water that I shuddered to plunge my Teva-clad feet into. That water was calf-deep in their kitchen, their living and dining room. 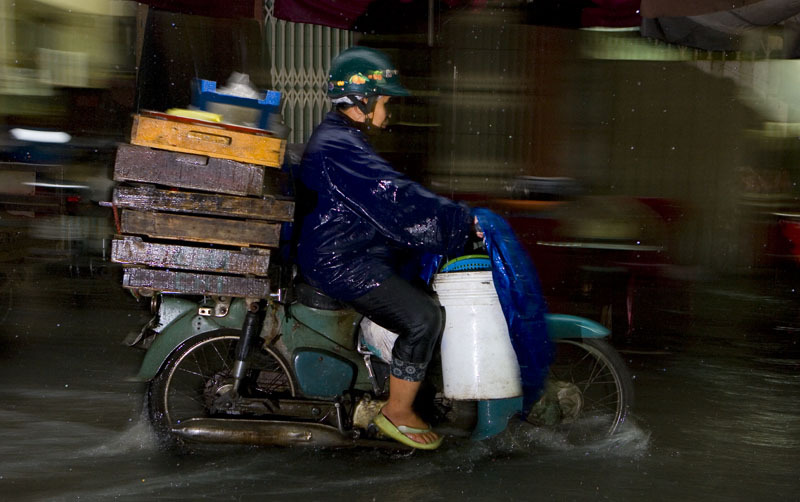 Do you know how many times a rainy season it rains like that, in Saigon? Sitting on that stoop, I was reminded of Shanghai in the late nineties: all gloss and glitter on the surface, not quite so shiny underneath. 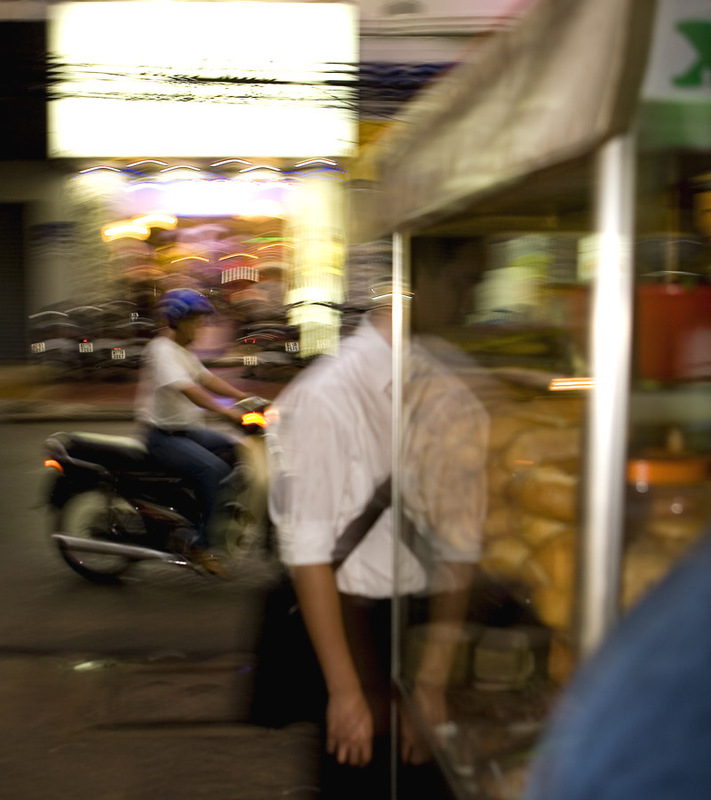 Saigon at night on the back of a motorbike is like a stroll up Nanjing Road to the Bund - Neon! Hubbub! Buzz! Locals riding the wave of growth and prosperity! The new, improved, modern [fill in city name here]! Every bit the fabulous. But, for some, not quite the whole picture. 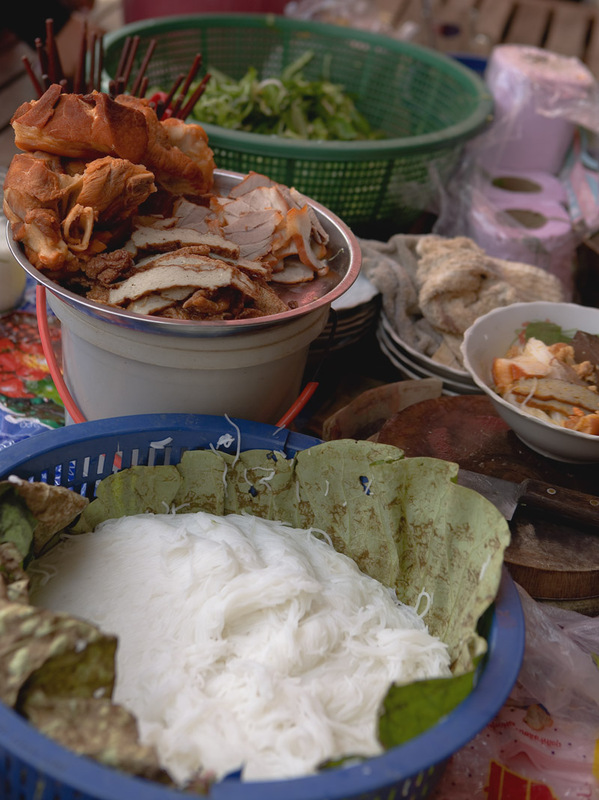 Our first foray to Siem Reap's Psar Loeu turned up much deliciousness with no negative digestive consequences, so we set aside a morning to return for breakfast(s). 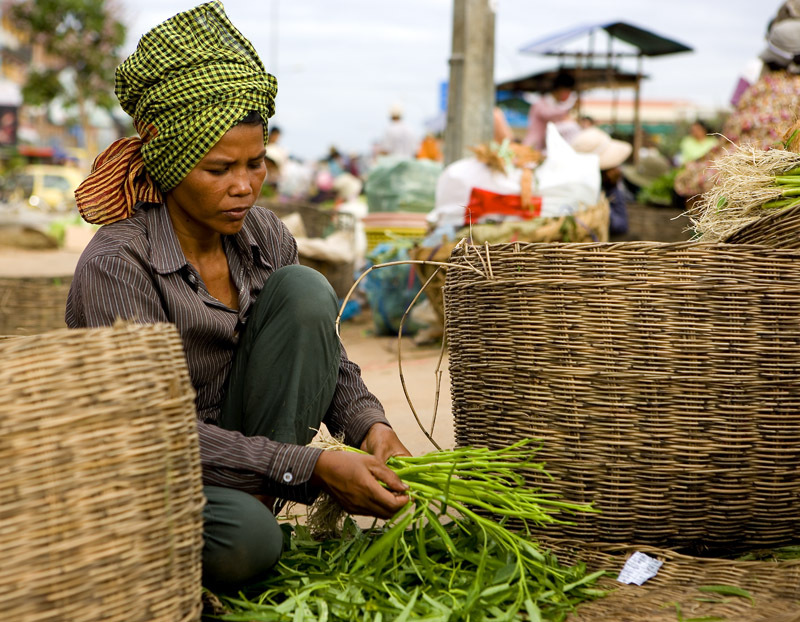 The market is (unsurprisingly) hopping at dawn; out front, along a main road into town, and in alleys all around its perimeter primarily female vendors sell heaps of fresh vegetables, fragrant herbs, roots and rhizomes. 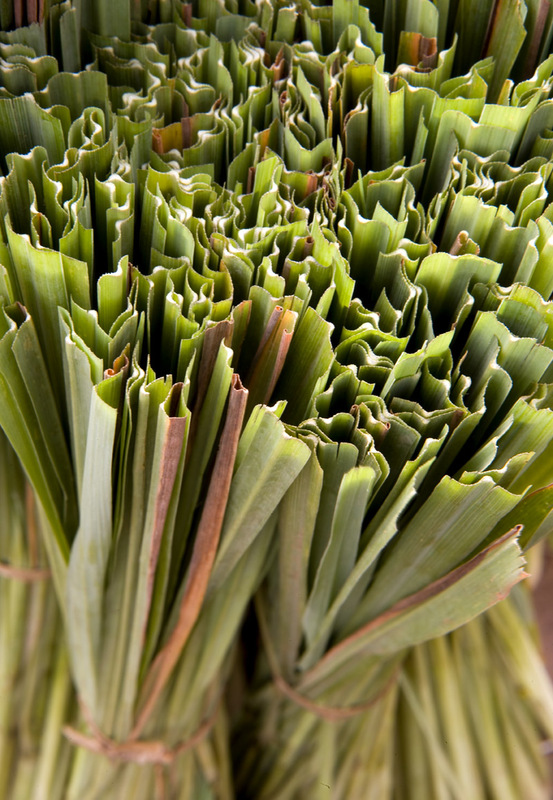 I counted tens of baskets of lemongrass with stalks so plump they could be used in entirety, and seven types of eggplant (small, round and white; tiny, round, and green; big, bulbous, and purple, golf ball-sized green and white striped ...). Also abundant in the market's aisles is prahok, or fermented fish condiment, in various grades and states of fermentation. 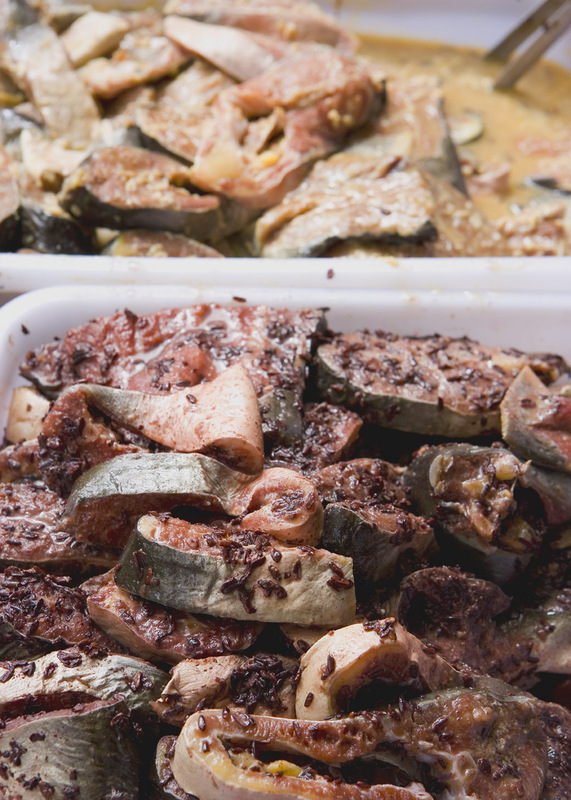 For some varieties of prahok fish is fermented with red rice, for others, with white. Some are made with small whole fish and others with fillets or steaks of larger fish; some are sold early in the fermentation process, when the fish still holds its shape, others long after rot has broken the fish down into a challengingly fragrant mush of flesh. Perhaps I've been in Southeast Asia too long but the smell of prahok (or bplaa raa, or trassi or belacan or mam tom) doesn't put me off at all. On the contrary, it gets my stomach rumbling as thoughts of fishily fragrant soups, curries, and pounded salads fill my head. In whatever form prahok is sold, there's one surefire way to determine its quality: lift a spoonful to your face and take a big sniff. Appetites roused by the scent of rotten fish, we were easy marks for a vendor cooking up pork and veggie-filled egg omelettes. Had we been in 'danger-danger!' 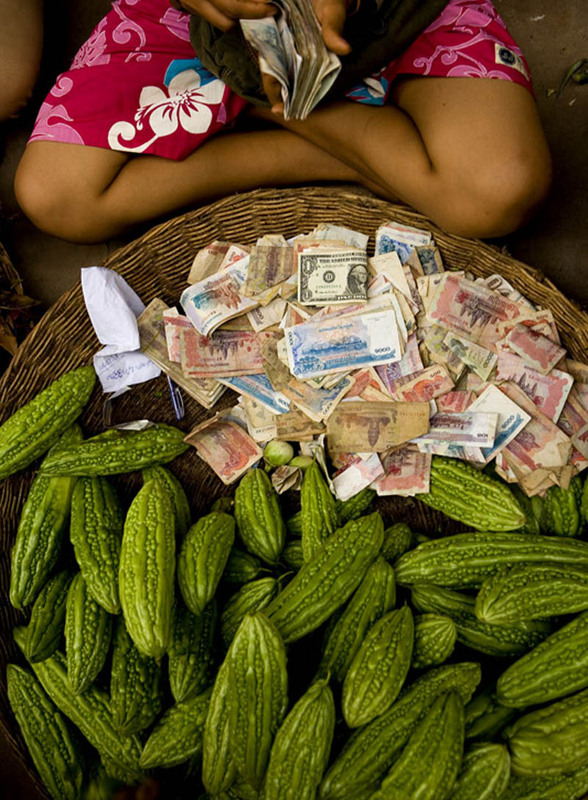 mode the copious fresh - and very wet - vegetables piled on her display might have put us off. But we'd chowed on fresh greens with our num ban-chok with no ill effect. And it was our last morning in Siem Reap, our last chance - for a few months, at least - to get a taste of Cambodia. 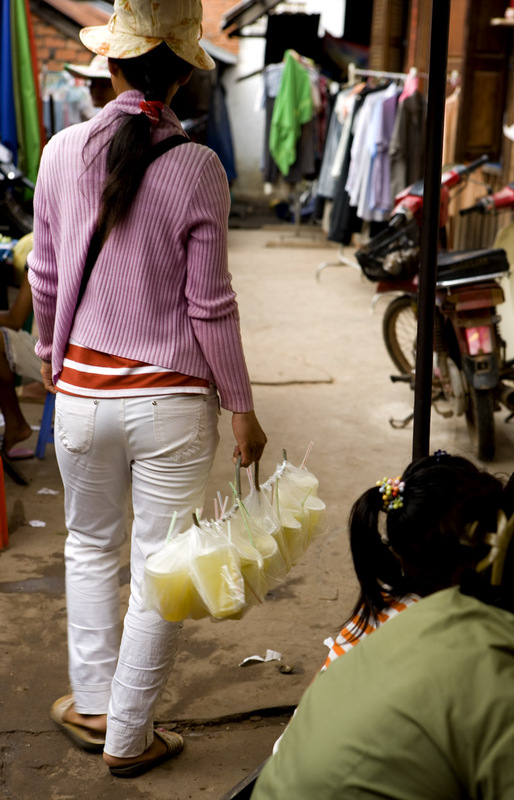 and when a woman selling cups of fresh iced sugarcane juice sauntered by, we didn't hesitate. At this point the calculus goes something like this: We've already ingested what common wisdom says are most 'risky' - ice and wet, uncooked vegetables and herbs - in filthy surroundings. There's a whiff of freedom in the moment that we give voice to thoughts such as this. In this moment it seems insane not to explore further, and extensively. 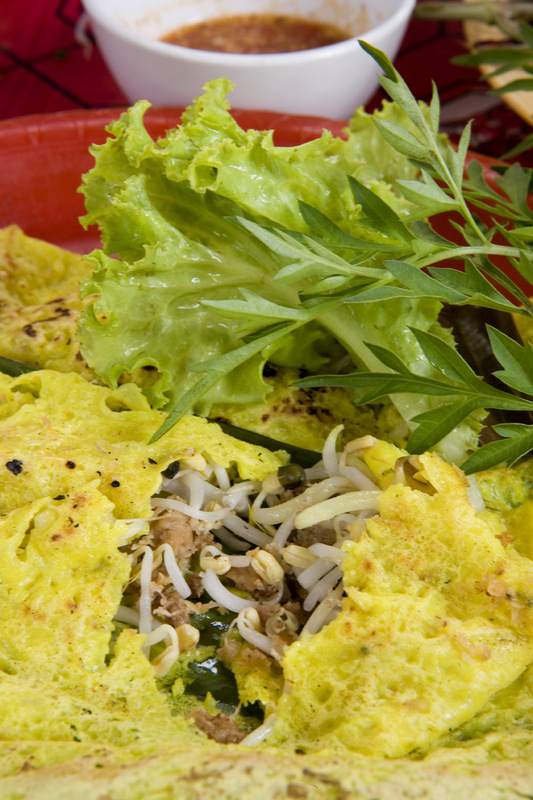 and wrapped around moist and meaty gratings of fresh coconut. We declined the optional sprinkle of white sugar. 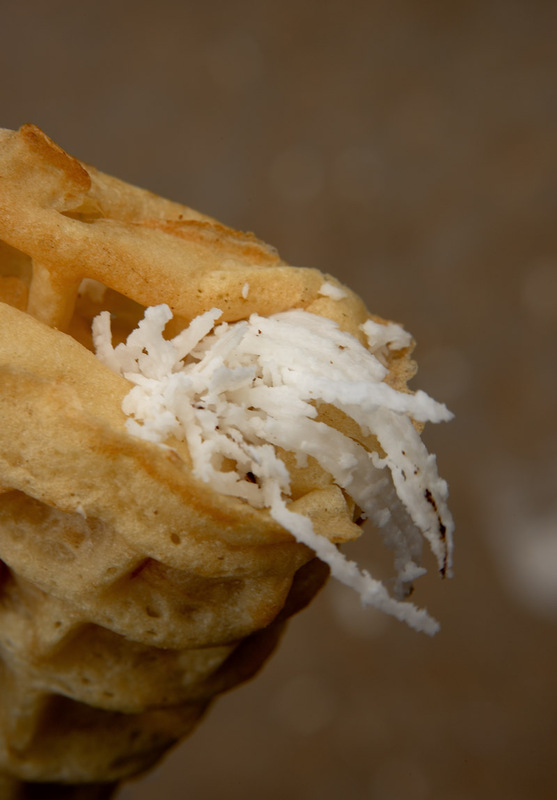 Absolutely brilliant - soft and chewy hot waffles, coconut two ways. 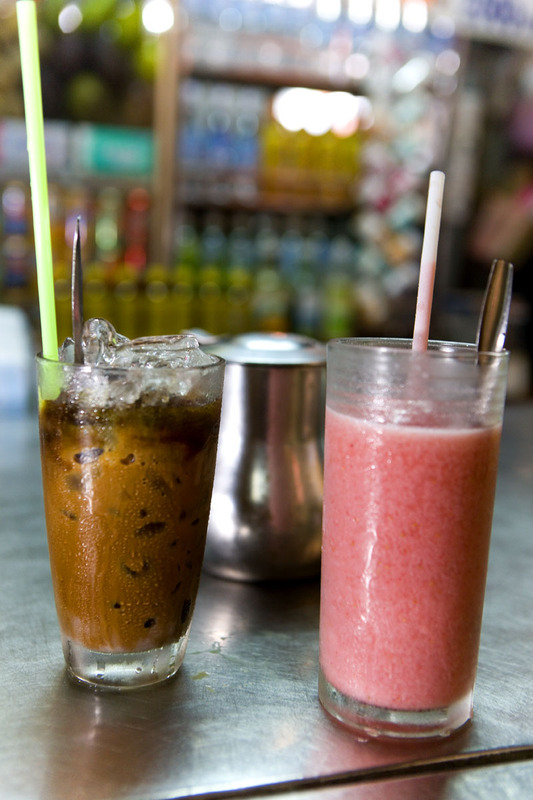 Those averse to Asian savory stuff in the a.m. should still head to Psar Loeu in the morning, just for these treats. Next up, a marvelous bowl of noodle soup, made with a variety of pork cuts, lots of vegetables and herbs, and num ban-chok. 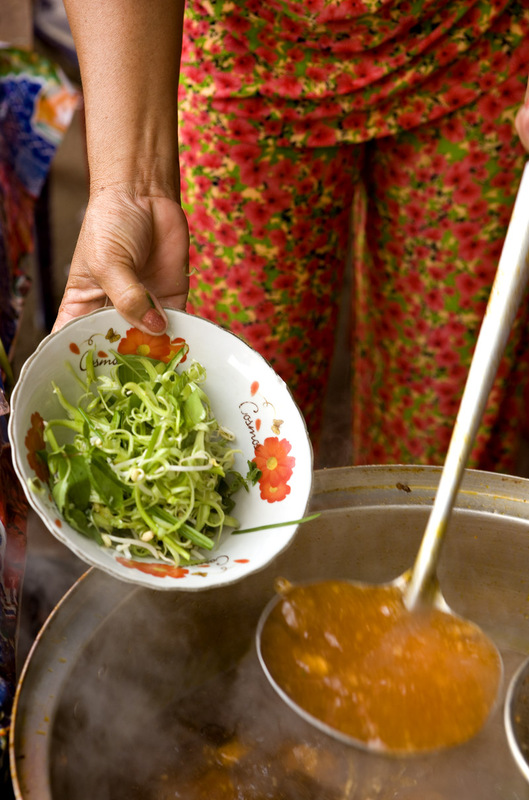 We love the Cambodian and Vietnamese method of 'broth blanching', or softening and warming the ingredients with a wash of hot broth that's strained back into the soup pot. The result is so much more flavorful than when noodles and veggies are dunked into plain boiling water. and then, finally, broth and a flurry of herbs. This thin broth was so meaty, quite spicy, and every so lightly sour from small tomatoes. A good thing to know is that in settings where dishes, such as noodle soups like this one, come packed with vegetables and herbs (Vietnam, Cambodia, Laos, sometimes Thailand), it's perfectly acceptable to ask for more to be added to your bowl at some point in your meal. 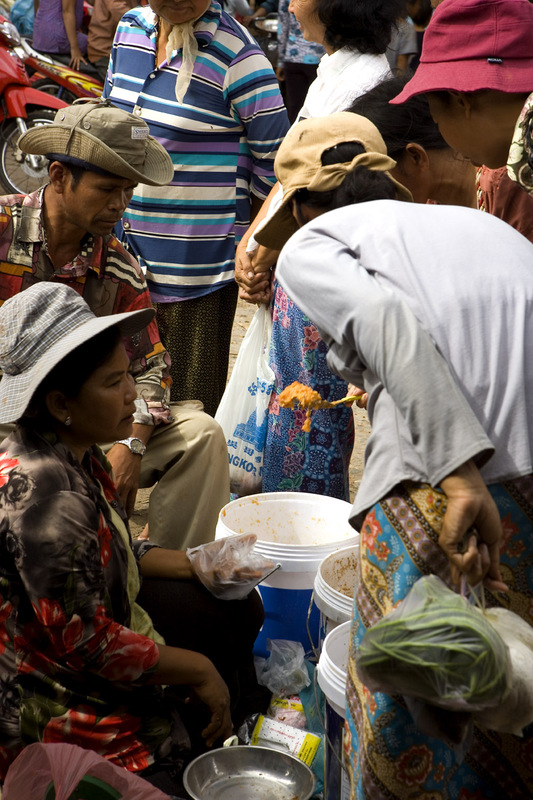 On this morning, after we'd eaten most all of the pork and vegetables but still had half a bowl of broth, we asked the vendor to add more shrubbery; she happily obliged, broth-blanching the veggies in another bowl before sliding them into our broth. The price was adjusted accordingly. 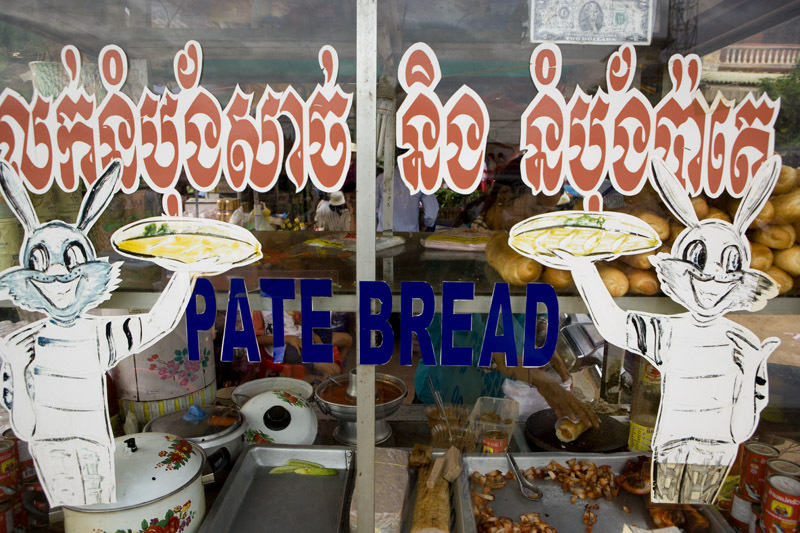 We ended this morning at Psar Loeu with a pate bread (known in Vietnam as banh mi). 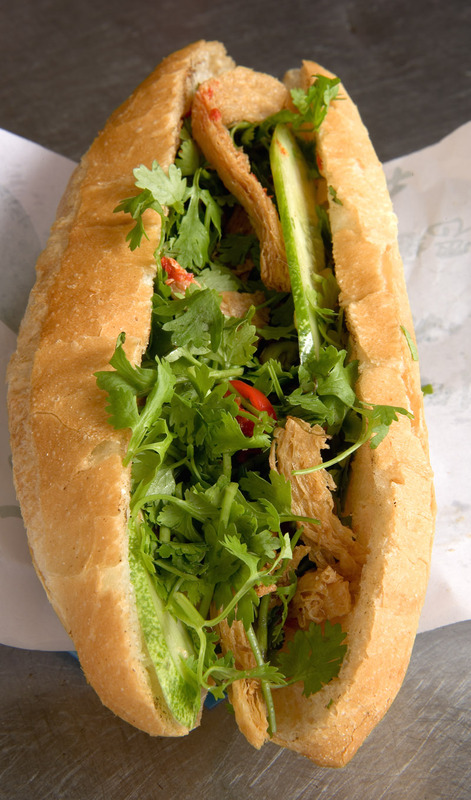 It wasn't the best version of our trip (we were, after all, heading to Vietnam, aka Southeast Asia's Sarnie Paradise), but it topped up the tank enough to hold us over till we could hit the streets of Saigon a few hours later. 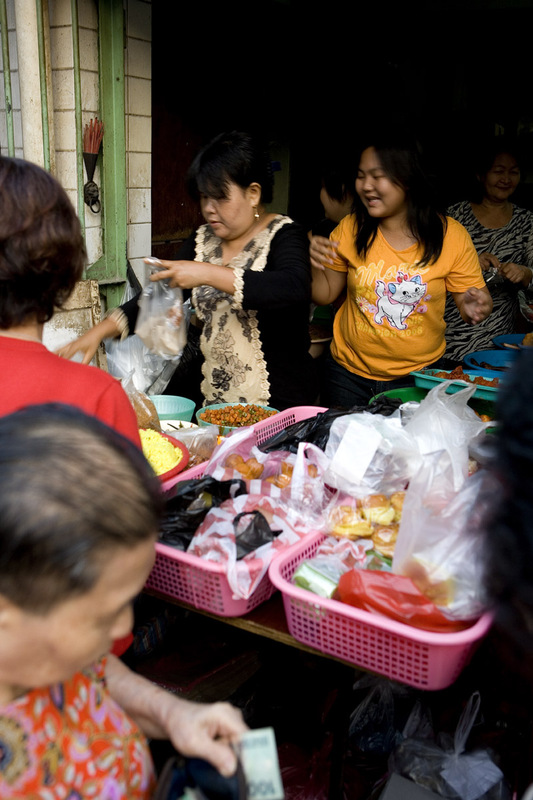 There's lots more to be sampled at Psar Loeu (early morning is best). 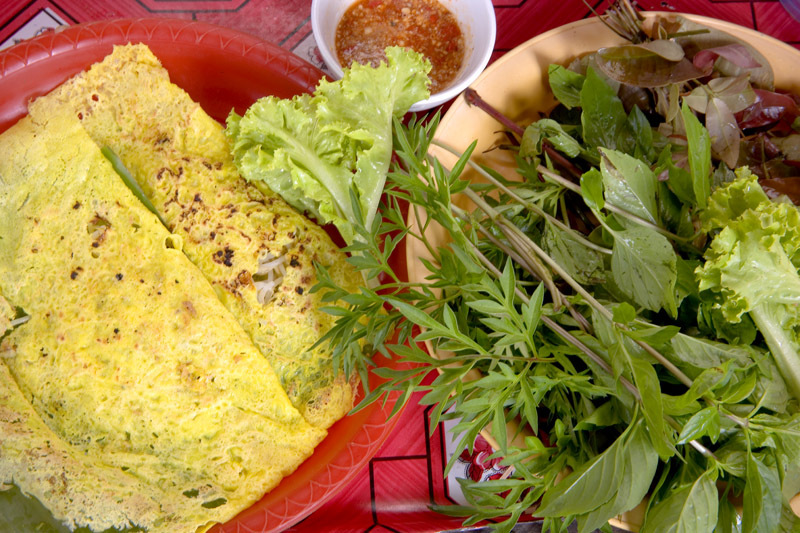 If you're heading to Siem Reap and are an adventurous eater, don't miss it. 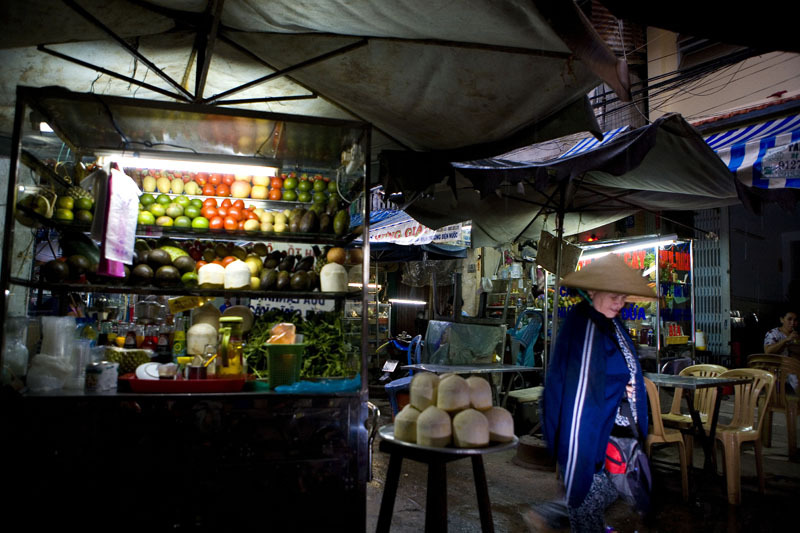 Note: we had no ill effects from eating at Psar Loeu but of course can't guarantee the same thing for you. Where to find the food: If you stand facing the market building, the crepes vendor is down the alley that is perpendicular to the alley that hugs its right wall; the waffle vendor sits near the junction of the two. 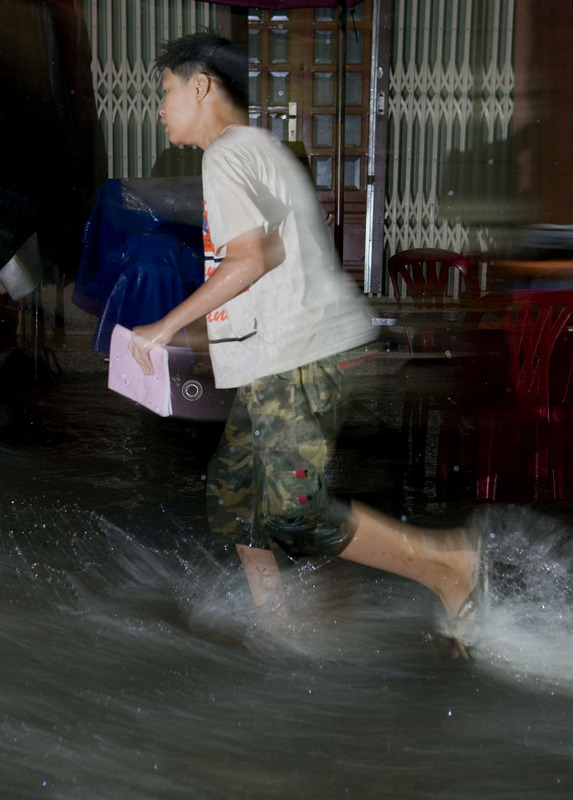 The pork noodle soup vendor is on the alley running behind the market building. Her stall sits in front of a teeny coffee stall in the corner of an old wooden building.